I have forgotten my ID proof and I'm doing an Indian domestic flight. Can I still fly? I am travelling from Delhi to Indore, a domestic flight. I forgot to take ID proof. Can I still fly? As per the guidelines, it is mandatory to carry a Government issued photo identification (ID) proof along with the E-Ticket for domestic flights in India. The same is verified by the airport security as well as the airline at the check in counter. The valid photo identification documents allowed are: Valid Passport / Driving License / Election Voter Card / Ration Card/ Aadhar Card/ PAN Card/ Photo Identity cards issued by Government On presenting your photo ID proof and E-Ticket copy, your boarding pass will be issued. You need to present the original copy of the ID proof. Also, as per Air India Support photocopy of the same will not work. 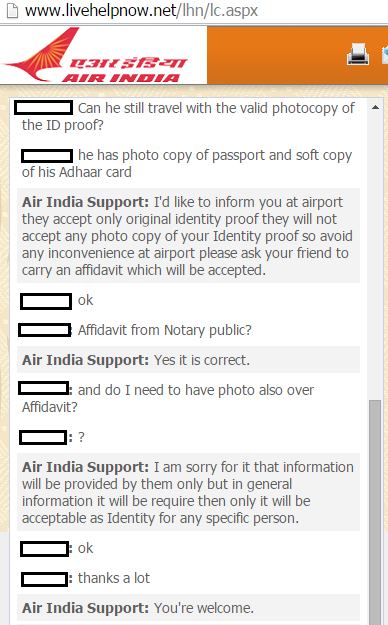 Because at airport they accept only original identity proof they will not accept any photo copy of your Identity proof so avoid any inconvenience at airport please ask your friend to carry an affidavit which will be accepted. In addition to it, you can carry an Affidavit from Notary Public (preferably with your photo over the Affidavit) stating your name and address etc. which will work as your Identity document. This Affidavit you can easily get from Notary officials sitting near the court area, or any office which you know and you can ask them that you need it for which purpose. You may need to shown your Passport copy and Adhaar card copy to them (preferably color printed) for assuring them that you are not wrong person. They may charge you some fee for this document. On the top of all, if you have 1-2 days for your travel then you must get your documents courier to you by 1-day shipping facility like FedEx, DTDC or FirstFlight etc. This will solve all your issues and you don't have to waste your time at Airport for such things. Note: Photo Credit Card are also not accepted as Identity proof (this was mentioned on one of the sites that you can use that, but as per Air India support it is not accepted as ID proof). An e-Aadhaar copy is valid, legal proof of identity throughout India, just as good as the "original". In fact this is one of the primary benefits of the Aadhaar system. This [Aadhaar] number will serve as a proof of identity and address, anywhere in India. Aadhaar letter received via India Post and e-Aadhaar downloaded from UIDAI website are equally valid. UPDATE 30-05 - I confirmed with IndiGo customer support that e-Aadhaar copy can be used for entering the airport as well as boarding flights. Central Government or any of its Ministries. Senior Citizen card issued by State/Central Govt. Not the answer you're looking for? Browse other questions tagged legal india paperwork domestic-travel or ask your own question. Is a US drivers license adequate for domestic flights in India? Can I take a US domestic flight as a foreigner without my passport? Can I use my school ID card for an Indian domestic flight?